VIRAL: Cat Opens FIVE Doors To Get Outside - POP GOES THE WEEK!! I’ve said it before, and I’ll say it again… cats don’t need us. I’ve said it before, and I’ll say it again… cats don’t need us. Especially this one, named Leon The Cat, who is able to skill maneuver the doorknobs on FIVE doors, to gain sweet, sweet freedom! Hopefully he can’t figure out the locks just yet. This is Hank. Hank is adorable – as evidenced by how joyful he is when he gets a new pool on a hot summer day. 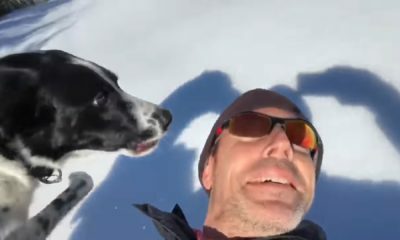 A man going for a walk with his dog and encountered an icy bill… So icy, in fact, that he didn’t even need a sled, he need only lie on his back and slide down. 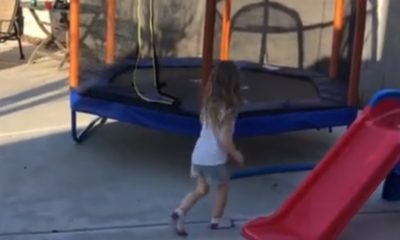 The dog was so ecstatic that… Well watch and see… the sweet ride shows why dogs are simply the best.